The human ear is one of the more remarkable parts of the human body, not only because of the beauty and unlikelihood of its structure, but also because of its remarkable sensitivity to sounds. From an anatomical point of view, the ear is conventionally and conven­iently divided into three parts: the outer, the middle and the inner ears. 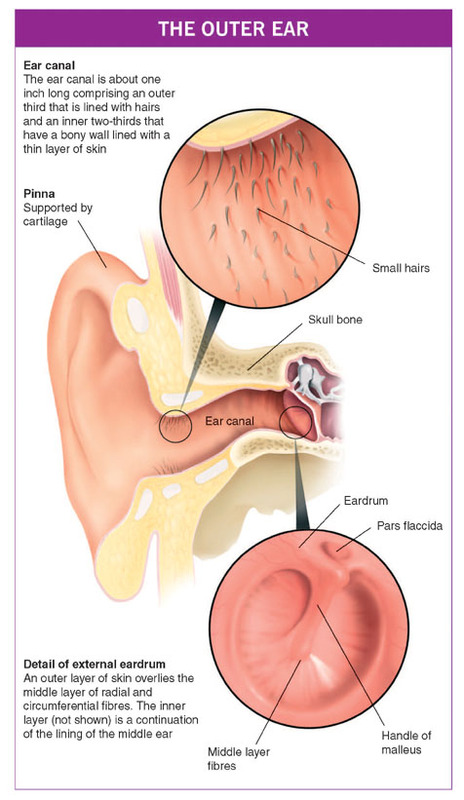 The outer ear comprises the pinna (auricle), which is made of a convoluted plate of flexible cartilage that extends as a nearly closed tube one-third of the way down the ear canal. This outer third, which is about eight millimetres (one-third of an inch) long, has small hairs that point outwards to form a line of defence against small animals creeping in. The roots of the hairs produce oils and these mix with the secretions from nearby sweat-like glands to form the basis of wax. The deep two-thirds of the ear canal (16 millimetres/two-thirds of an inch long) has a bony wall lined with thin and rather fragile skin which is devoid of glands. At the far end of the ear canal and stretched across it is the eardrum (tympanic membrane), which forms the boundary between the outer and middle ears. The eardrum is a circle of thin skin about eight to nine millimetres (one-third of an inch) in diameter. Despite its name, it is not flat like the skin of a drum, but is slightly conical with the curved sides sloping inwards. The eardrum has three layers. In contact with the deep ear canal, the outer layer is covered with a thin layer of skin. The inner layer is in continuity with the lining of the middle ear, and consists of rather flat cells that have the ability to transform into the type of cells that line the nose and sinuses. Following infection, chemical irritation – such as tobacco smoke – or allergy, these cells alter and produce mucus which flows into the middle ear. The middle layer of the eardrum is very important and consists of elastic fibres arranged both like the spokes of a wheel (radial fibres) and in circles (circumferential fibres), so that this layer is like a sprung trampoline net. The larger lower three-quarters of the eardrum (the pars tensa) is tense and absorbs sound. The smaller upper portion of the membrane is more floppy because the fibres of the middle layer are not organised in regular patterns, and this region is called the pars flaccida. 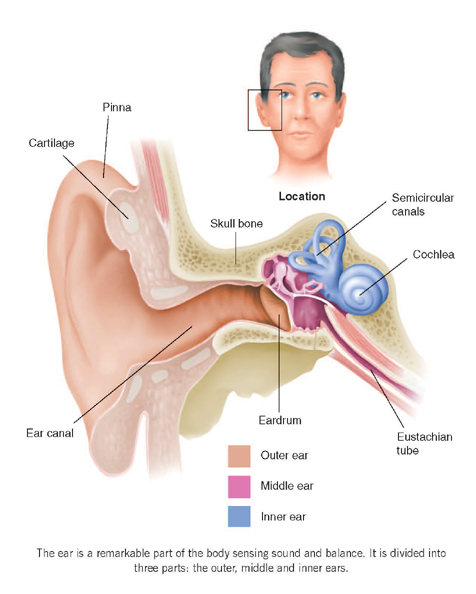 The middle ear itself (the tympanum) lies deep to the eardrum and is an air-filled space that holds three small bones (ossicles), which connect the eardrum to the inner ear. These bones are called the hammer (malleus), anvil (incus) and stirrup (stapes) because of their resemblance to these objects. The hammer has a handle and a head and the handle lies within the layers of the eardrum. The head of the hammer sits in the upper part of the middle-ear space called the attic (epitympanum) and is connected by a joint – just the same as any other joint in the body – to the rather bulky body of the anvil. From the anvil, a long strut (the long process) descends back into the middle ear proper and is connected to the head of the stirrup. The two arches (crura) of the stirrup join the footplate, which sits in a small (3 mm × 2 mm) hole in the skull called the oval window (fenestra ovalis). This is the opening into the fluid-filled space of the inner ear. Just below the oval window is another small hole into the inner ear called the round window (fenestra rotunda). A thin membrane closes this and, when the footplate of the stirrup moves ‘in and out’, the round window membrane moves ‘out and in’ because the fluid in the inner ear transmits the pressure changes. The hammer and anvil are supported in the middle ear by several membranes and ligaments, which minimise their weight, allow them to move easily and bring them a blood supply. Unfortunately, this leaves only a small space for the passage of air from the middle ear to the attic. Running through the middle ear is the facial nerve (nerve VII or the seventh nerve). This nerve leaves the brain and has to pass through the skull on its way to supply the muscles of facial expression, that is, muscles for frowning, winking, smiling, scowling, and so on. The nerve lies in a thin bony tube and runs horizontally from the front to the back of the middle ear just above the oval window and stirrup, before it turns downwards to leave the base of the skull. The nerve then turns forwards to reach the face. The facial nerve is therefore relatively vulnerable in diseases of the middle ear and, indeed, in middle-ear surgery itself. A facial palsy results in one side of the face being paralysed, so that the face droops and fails to move. Smiling results in a scowl and drinking in dribbling, and the eye fails to close on blinking. Running through the eardrum is the nerve that carries taste from the front two-thirds of the tongue (the chorda tympani nerve). This nerve is on its way to join the facial nerve in the middle ear where it ‘hitch-hikes’ a lift back to the brain. Finally, there are two small muscles in the middle ear. The one at the front (tensor tympani) is attached at the top of the handle of the hammer and tenses up the eardrum when swallowing activates it. The function of this muscle is not clear but it may be to make eating and swallowing a less noisy event. The muscle at the back of the middle ear (stapedius) arises near the facial nerve, is supplied by it and attaches to the head of the stirrup. It responds to loud sounds by contracting and stiffening the chain of small bones, and possibly reduces transmission of prolonged and potentially damaging, loud sounds to the inner ear. The inner ear is probably the most remarkably intricate piece of the body. It makes hearing possible by converting sound into electrical impulses that then travel along the hearing nerve (the acoustic nerve or auditory nerve) to the brain. The inner ear also plays a major role in balance. The balance portions of the inner ear (vestibular labyrinth) can detect acceleration of the head in any direction whether in a straight line (linear) or twisting and turning (angular). The electrical signals that arise in response to head move­ment pass along the balance nerve (vestibular nerve), which in due course joins with the hearing nerve to form a single bundle (stato­acoustic, vestibulo-acoustic or eighth nerve, nerve VIII) which then enters the brain. The portion of the inner ear that actually hears is the cochlea. This is a hollow coiled tube set in the very dense bone called the bony labyrinth (part of the petrous [rock­like] temporal bone). This tube is filled with fluid, which is much the same as general body fluid (lymph) and that which surrounds the brain (cerebrospinal fluid – CSF). This inner-ear fluid is called perilymph. 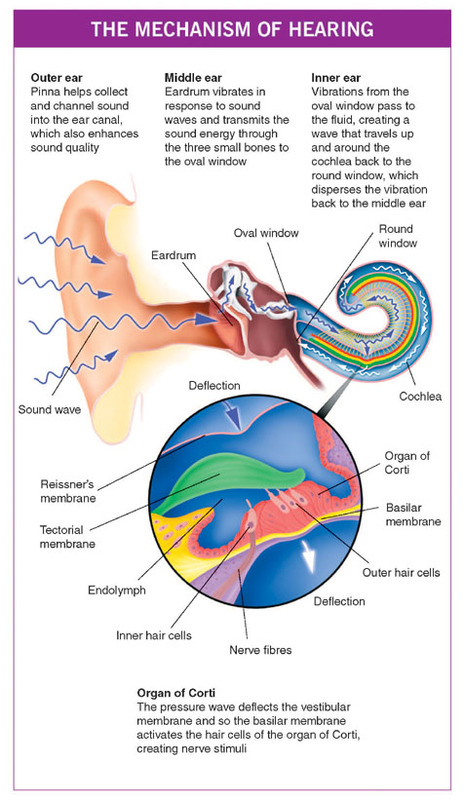 Inside the perilymph is another coiled triangular-shaped tube called the cochlear duct (scala media), which contains the all-important ‘hair cells’ – these convert sound into electricity. These hair cells are arranged in two groups that follow the coils of the cochlear duct and spiral upwards from base to apex. There is a single row of inner hair cells (IHCs), which lie closer to the core of the cochlea (modiolus), and three or four rows of outer hair cells (OHCs), which are further away. In a healthy young human ear there are about 3,500 IHCs and about 12,000 OHCs. Each hair cell has a cluster of small rigid hairs (stereocilia), which project from the thicker upper surface of the cell into the special fluid that fills the cochlear duct. This fluid is called endolymph and is remarkable in that it has a strongly positive electrical charge associated with it – about 80 millivolts – and is rich in potassium, a metallic element. The hair cells in their rows are grouped together with their supporting cells in the organ of Corti. This is a small ridge that sits on a thin, very flexible membrane called the basilar membrane. The basilar membrane forms the floor of the triangular cochlear duct. The sloping roof is another very thin membrane (Reissner’s membrane) and the side wall is a thickened region rich in blood vessels (the stria vascularis). This structure is responsible for maintaining the composition of the rather unusual and very important endolymph. 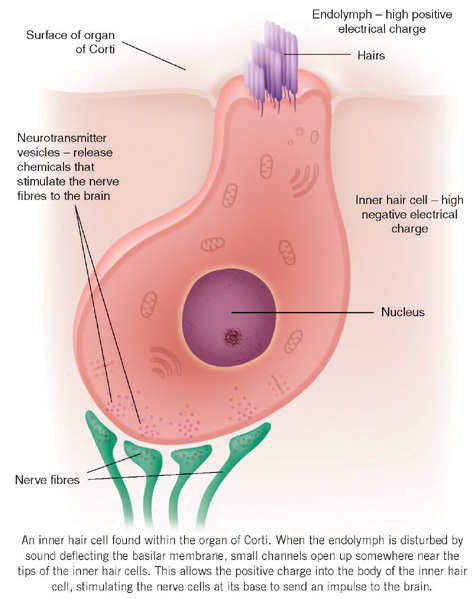 Adjacent to the base of the hair cells are the nerves that carry impulses to the brain (the afferent nerves). At least 90 per cent of these nerves come from the inner hair cells, despite their smaller number. Each inner hair cell has about 10 nerve endings attached to it and there are, therefore, about 30,000 nerve fibres in the acoustic nerve. The outer hair cells have nerves attached to them but most are nerves coming from the brain (the efferent nerves), whose function is described later. The hearing nerves travel inwards, along with the balance and facial nerves, through a canal in the inner part of the skull (variously called the internal auditory meatus [IAM], internal auditory canal [IAC] or porus acousticus) to reach the brain stem. This part of the brain deals with lots of automatic functions such as pulse, blood pressure, general alertness, balance, and so on. About half of the hearing nerves from each ear cross over to the other side of the brain stem and then, on both sides, the nerves pass up the brain stem through the mid­brain, eventually to reach ‘conscious­ness’ in what is called the cortex of the brain. For hearing, this conscious region is located in the temporal lobe portion of the brain, which lies on each side of the head just above the ear. Sound travels as small waves of pressure through the air at a speed of about 343 metres per second (740 miles per hour). The waves of sound are rather like ripples on the surface of a pond spreading out after a stone has been thrown in. These waves have pitch (frequency) and that is the number of crests that pass a point in a second. Pitch is measured as ‘cycles per second’ (cps) which is now more commonly written as hertz (Hz) after Heinrich Rudolf Hertz (1857–1894), a pioneering scientist who worked on theories of light and electricity; 261 Hz is equivalent to middle C on the piano. One thousand cycles per second (1,000 cps) is one kilohertz (1 kHz). Sound waves also have intensity and, when the comparison is made with ripples on the pond, this equates to the volume of the wave. In real life, it is easier to measure the pressure of the wave rather than its intensity and this pressure is measured in units called pascals (Blaise Pascal [1623–1662] was, among other things, a mathematician and physicist of genius working on statistics, probability and geometry, and atmospheric pressure). One pascal is rather large for sound pressure measurements so that micropascals (µPa), that is, one-millionth of a pascal, tend to be used. 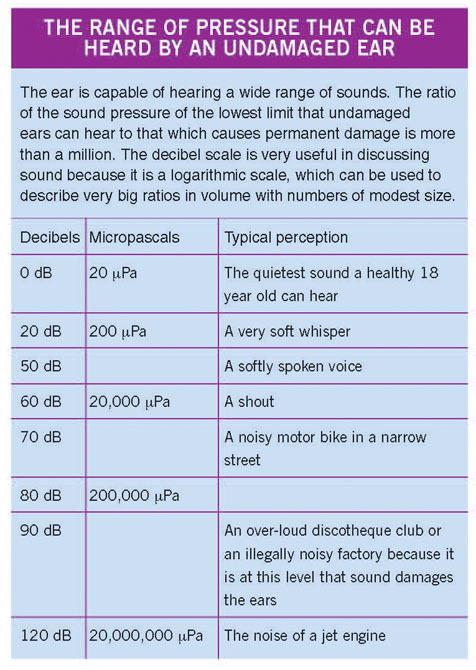 The quietest sound that the average healthy 18 year old, without previous ear problems and with normal eardrums, can hear has a pressure of 20 micropascals (20 µPa). This level forms the basis for measuring the pressure of other commonly heard sounds in our environment. 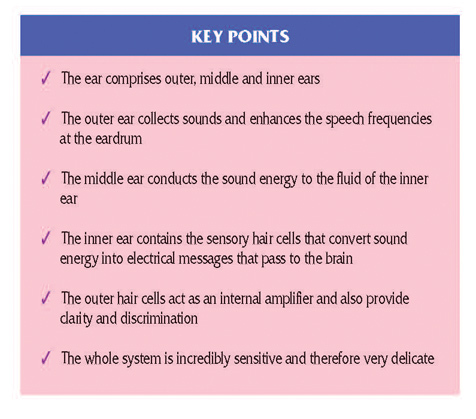 The range of pressures that the ear can hear is enormous. The quietest, just detectable sound may be 20 µPa, but a jet engine heard close by has a level of 20,000,000 µPa. For convenience these levels are recorded as decibels (dB) after Alexander Graham Bell (1847–1922), teacher of the deaf and inventor of the telephone, the audiometer and gramophone, who derived a convenient way of expressing this huge range of sound pressures. Sound waves are partly collected by the pinna, which in humans has only a limited function. You will have noticed how dogs prick up their ears in response to an interesting sound; this enables them not only to hear better but also to localise the source of a sound more accurately. In humans, the convolu­tions of the pinna do help a little in both respects, but complete loss of the pinna only reduces the hearing by a few decibels, although sound localisation is impaired. The ear canal not only protects the eardrum from direct damage, but also has a role in hearing. The resonance properties of a tube that is open at one end and closed at the other result in sounds being enhanced over a certain frequency range at the closed end of the tube. The common example of resonance happens when you blow across the top of an empty bottle to produce a note. If the bottle is then partly filled with liquid, the note changes as the resonance properties change. 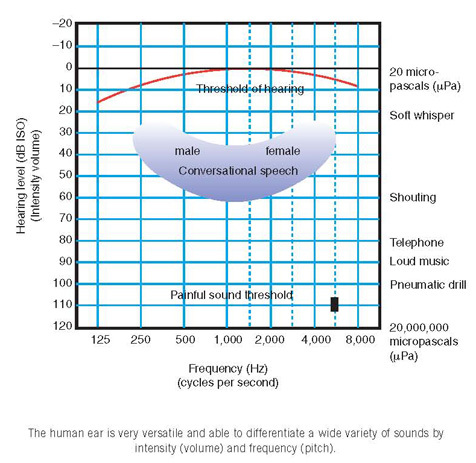 For the dimensions of the human ear, this enhancement is most marked in the range 1,500–6,000 Hz which just happens to include most of the frequencies used for speech and sorting out one complex sound from another – for example, speech from background noise. The large area of the eardrum, which is not rigid but flexible and buckles slightly to help absorb energy, now collects the sounds. The hammer, anvil and stirrup transfer this sound energy to the relatively small area of the oval window. This system, which comprises the large flexible eardrum linked by a chain of bones with a small lever action to the inner ear, is really quite efficient in converting airborne sound waves into sound waves in the fluids of the inner ear. Normally, when sound hits the surface of a liquid, 99.5 per cent or more is reflected. The operation of the middle-ear mechanism results in about 50 per cent of the sound reaching the eardrum being trans­ferred to the inner ear. As sound waves hit the peri­lymph beneath the footplate, they create a wave that travels up and around the cochlea. This travelling wave builds up to a maximum for each particular pitch and then rapidly falls away to nothing. 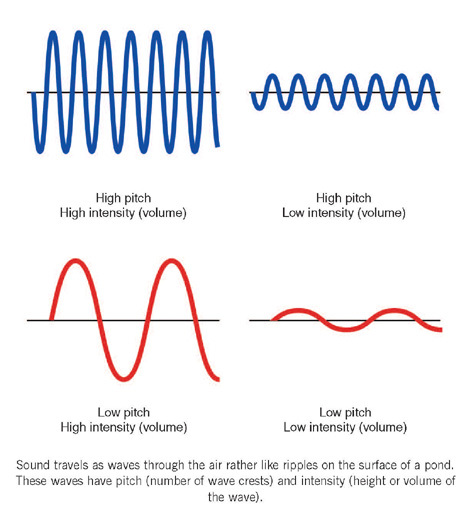 The location of the peak of the wave varies at different pitches: for high-pitched sounds, the wave peaks near the base of the cochlea, whereas for low-pitched sounds this peak is near its apex. 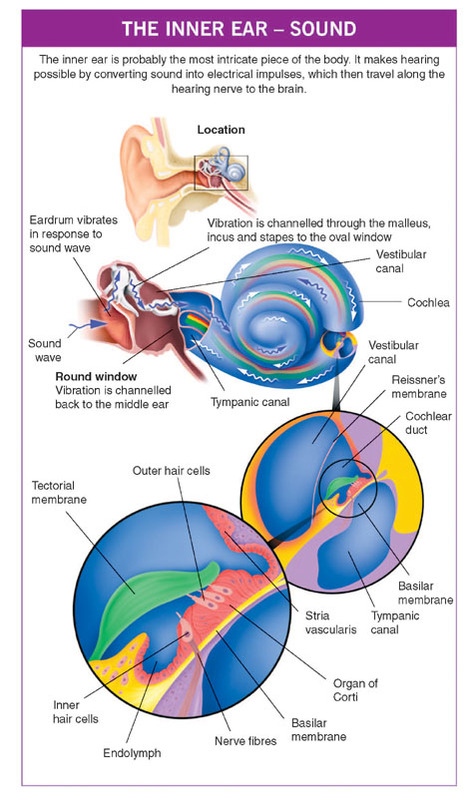 As this pressure wave passes through the cochlea, there is movement of the thin basilar membrane and, along with it, the organ of Corti containing the hair cells. Overlying the hair cells is a gelatinous membrane called the tectorial membrane. One edge of this is attached to the bony core at the centre of the cochlea (the modiolus); the other is loosely attached to the organ of Corti outside the outermost outer hair cell. The tips of the hairs of the OHCs are lightly embedded in the under-surface of the tectorial membrane whereas the tips of the IHCs (which, as mentioned earlier, give rise to most of the nerve fibres) do not reach the tectorial mem­brane and stand free in the endo­lymph. As the travelling wave reaches its peak, the OHCs near this peak give a small, physical ‘kick’ to enhance the movement of the basilar membrane. This internal amplifier causes the endolymph to squirt towards the hairs of the IHCs. If the movement of fluid is great enough, the hairs are deflected and very small channels open up some­where near the tips of the hairs. The potassium in the endolymph can now flood down through these small channels, being propelled by the very strong positive electrical charge of the endolymph into the bodies of the IHCs. Here the influx of potassium alters the hair cell membrane and small parcels of chemicals are released from the base of the hair cell, causing the nearby nerves to become active and send pulsed signals towards the brain. The signals pass from one relay station to the next in a regular fashion and have complex inter­actions in the brain stem. About one-fifth of a second after detection, electrical signals reach the auditory areas of the brain (auditory cortex of the temporal lobes) and sounds are perceived. At each step, the system is set to maximise sensitivity to sound. 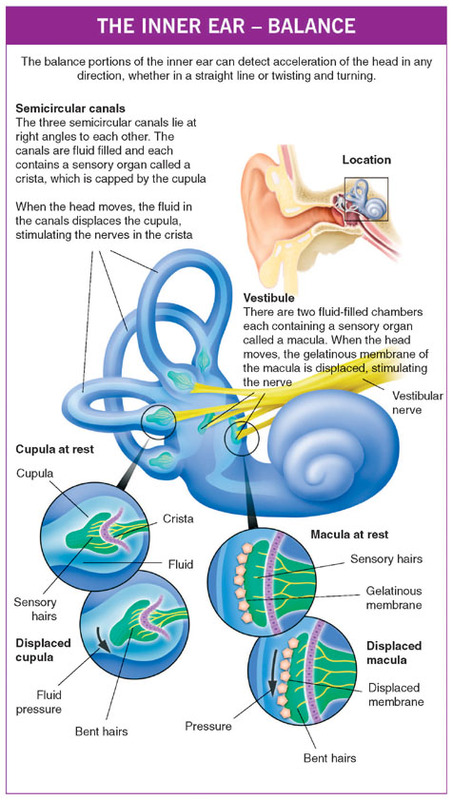 There is the very well-balanced middle-ear mechanism, which generates the pressure changes in the cochlea that result in the complex travelling wave; this, in turn, depends on the delicate fine structure of the cochlea. There is the highly unusual fluid named the endolymph and a quite remarkable internal cochlear amplifier. Why so? Quite simply, hearing is an impor­tant and efficient early warning system. Without good hearing most mammals would find it difficult to survive. In order to hear, creatures living on land need to have an eardrum with air on both sides to collect airborne sound and transfer it onwards to the inner ear. Reptiles, birds and mammals all have the same system, although the numbers of bones are different in the three groups and birds have only one strut-like bone between the eardrum and inner ear. In mammals, the middle ear is lined with a tissue that is rather like the lining of the nose, with mucus-producing glands and cells with a surface covered by moving flexible hairs or cilia – not to be confused with the stereocilia of the hair cells, which are different structures altogether and which are not mobile. The middle ear is, therefore, an air-filled space, lined with living tissue capable of producing both debris from dead surface cells and mucus from the glands. This creates two problems: first, clearing the debris and mucus and, second, a more subtle but very important problem. Oxygen is absorbed from the air in the middle ear into the blood vessels running through its lining, in much the same way that oxygen is absorbed in the lungs. Some carbon dioxide is given off from those same blood vessels into the air in the middle ear, but overall the effect is a drop in middle-ear pressure as more oxygen is removed than carbon dioxide produced. With atmospheric pressure outside the eardrum, something has to ‘give’ and the only thing that can move is the eardrum. This would be pushed inwards by the external pressure and the eardrum would then stop working normally. Eventually the whole middle ear would collapse and a significant hearing loss would develop. When working properly, the eustachian tube prevents both these problems. This tube runs forwards and inwards from the front wall of the middle ear to open into the back of the nasal cavity above the soft palate (the nasopharynx). The end nearer the nose is soft and flexible, and opens when you swallow or yawn. 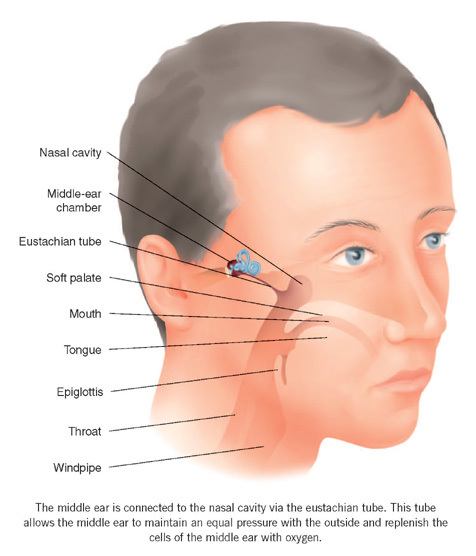 Although we do not know precisely how this mechanism works, when the eustachian tube opens, enough air enters the middle ear to replenish the oxygen that has been absorbed and so keep the middle-ear pressures close to atmospheric. It has been calculated that only one or two millilitres of air per ear per day – that is, less than half a teaspoon of air – are necessary to maintain proper ventilation of the middle ear, but without this the middle ear fails to perform properly. The eustachian tube is also the conduit along which the cilia move the mucus produced in the middle ear to the back of the nose, where it can be swallowed. This thin film of mucus, carrying the debris produced in the middle ear, is moved along the floor of the eustachian tube with air passing above it to reach the middle ear from the nose. Thus, the two functions of ventilation and self-cleansing are achieved when the system is working properly. Unfortunately, in humans, the mechanism is rather fragile and often fails to work adequately, possibly because of the shape of the skull that is needed to accommodate the large brain. There is also an extension of the air-filled spaces of the middle ear backwards into the mastoid bone. You can feel this as a rounded bump if you put your hand to the back of your ear. The mastoid bone should be hollow, with the air-filled spaces broken up by small and incomplete bony partitions rather like a honeycomb. The average mastoid has an air volume of about 15–20 millilitres (three to four teaspoons) and this helps to buffer pressure changes in the middle ear and reduce adverse effects on the tympanic membrane. People with small mastoid air spaces seem to be at a much greater risk of developing middle-ear and mastoid disease. As yet, we do not fully understand whether it is middle-ear and mastoid disease that cause the failure of the mastoid to develop, or whether a small size reduces the pressure buffer and therefore causes the development of disease. The probable answer is that it will be a bit of both.